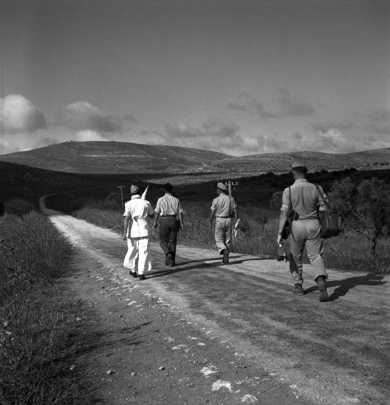 Carrying the truce flag, military observers with the United Nations Truce Supervision Organization (UNTSO) cross the no-man's-land that separates Merdya Youm (Arab lines) from Metulla (Israeli lines). The group is accompanied by an officer of the Israeli Army. The crossing of the front took place at the exact time agreed upon by both sides.